Ever thought this way, that social media is the one thing that get you traffic for your blog. Other then Google and Yahoo Search Engines most of the derived traffic to your blog is from social media’s such as Face-book, Twitter etc. Naming Social Media a treasure chest is because most of the bloggers engage on Social Websites such as Face-book and Twitter to get more and more traffic to their blogs. 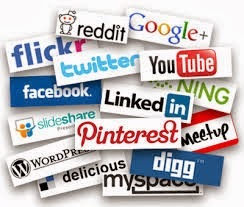 Most of the bloggers share their links on social websites such as face-book, twitter and sometimes on Google+ also. The interesting fact is that they get only 2-5% of the generated traffic from these social sites as compared to the website which have a paid domain extension like a .com or .net, they get 50% of the traffic from both search engines and from social sites. This is because many people only trust .com sites for information and do not wonder about for any other website with not a clean domain such as .blogspot.com or .wordpress.com. This gives them an upper hand on traffic sources. But despite this, if you have seen many un-paid domain name having .blogspot.com etc extension have been seen on the top search result of Google, Bing or Yahoo. First of all, the blogs which are on the top search result without any paid domain have given most of their blogging time in understand every Nail and Hammer for getting their blog on top. So, what they have done in Real. 1. Firstly, they have managed to get good and unique content on their blog. This is because only unique content on website and blog are indexed by Google and other search engines to show on their results. 2. Secondly, they have promoted their blogs via a proper channel. A proper channel here means to get correct audience to promote your blog. This can be achieved by making a good and impressive Face-book page and Group to engage more and more people from your blog. Only making a page and group will not ensure your blog success you have to make it working well also. 3. Third, and the most important things that they did is to make their blog ad free or have added very less ads which do not have any pop-up messages, having ad’s like this will quickly make your visitors lose its interest in your blog and will more on. These are some of the things that they did for getting their blogs on the top without have a paid domain. You can also apply the above mentioned steps to get you blog up and growing. Thanks Akhil Swatanra for visiting..